More and more people are ditching detached homes in the suburbs for high-rise life in the big city. According to figures released this morning from Statistics Canada as part of the 2011 Census, multi-unit dwellings -- a category that includes condominiums -- now make up roughly half of all new housing stock in Canada. Traditionally detached homes led the way in this category. In 2006, the last time the census was updated, close to 11 per cent of homeowners lived in condos. And though complete census information on home ownership across Canada won't be released until September, statisticians say, because of the population flow from the country to the city, it's clear more and more people are moving on up to a life lived in taller buildings. All you have to do is look at stats on building permits from across the country to see the trend. Take some condo info for Toronto from 2011: According to Urbanation, number crunchers for the development industry, some 16,000 new condo units were expected in the city by the end of that year (5,500 of which would be in the downtown core). The same thing is happening in Vancouver where permits to build multi-unit dwellings, like high-rise condos, are on the rise. So what's behind this upward trend? Researchers say it's a mix of economic and demographic factors. Condos, which can start at 400 sq. feet, are more affordable for young adults, first-time homeowners and new immigrants -- all people who gravitate toward city life. In some major city centres, like Toronto, the average detached home price is now $600,000. In Vancouver, it's $1 million. Condo prices in every city across the country are substantially less than that. What's more, young couples are putting off marriage and children, meaning there's less need to upsize their homes from a one- or two-bedroom space to a full-on house. Other factors fuelling this boom in condos include the growing backlash by suburbanites against grueling, overly long commutes; the desire by baby boomers to downsize their homes and lifestyles after the kids move out (aka: empty nest syndrome); and the desire of governments, environmental groups and urbanites to curb urban sprawl. "It's a big shift that we've seen over the last several decades,'' Adrienne Warren, senior economist and manager with Scotiabank, tells the Canadian Press. And it's a trend she believes will likely hold up over the long-term as the population ages and land grows even more scarce. 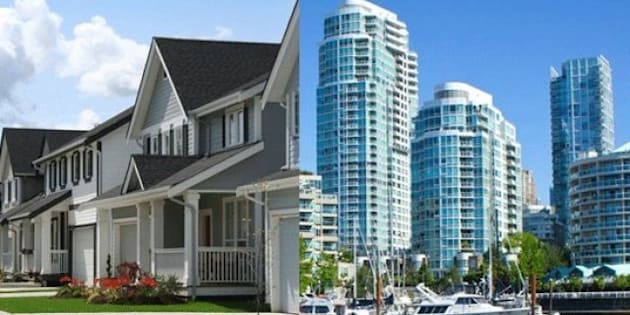 What can your money get you in terms of real estate across the country? Take a look at some of Canada's most expensive homes.